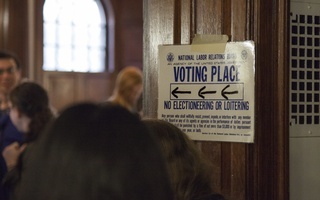 A posted sign directs voters to the polling place for the student unionization election in Nov. 2016. UPDATED: December 12, 2017 at 9:51 p.m.
Harvard will likely have to hold a new election to determine whether eligible students can form a union after the National Labor Relations Board ruled against the University’s appeal Tuesday. Harvard had appealed a previous NLRB decision requiring the University to hold a new election, arguing that the outcome of the Nov. 2016 election—the initial results of which showed more students voting against unionization than in support of it—should stand. Since August, the federal NLRB—a panel of presidential appointees—has weighed the University’s arguments, deciding Tuesday morning to uphold the previous NLRB ruling that the election results were invalid. Tuesday’s ruling means a new election could take place as soon as January 2018, former NLRB chairman William B. Gould IV said in an interview Tuesday. At stake is whether or not eligible graduate student research and teaching assistants and undergraduate teaching assistants at Harvard will collectively bargain with the University. HGSU-UAW representatives were quick to celebrate the decision Tuesday. Echoing labor law experts, unionization advocates had worried that the NLRB’s majority Republican membership would sink their chances after a more than year-long legal fight. In an emailed statement, University spokesperson Anna Cowenhoven said that Harvard stands by the results of the original unionization election. “The University continues to believe the November 2016 student unionization election was fair and that well-informed students turned out in high numbers to vote. It is disappointing that the NLRB has not upheld our students’ decision to vote against unionization in that election,” she wrote. This decision comes as the labor law precedent that allowed graduate students at private universities to unionize is under challenge on campuses across the country. Yale and the University of Chicago have filed briefs with the NLRB arguing that a 2016 Columbia University case that set the precedent for student unionization at private universities should be overturned. Both briefs argue that graduate students should not be considered employees. If the NLRB strikes down the Columbia decision, it could stop student unionization at Harvard, according to Gould. 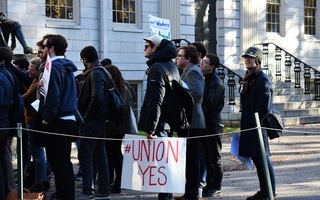 The Harvard appeal the NLRB struck down is more narrowly focused—it centers not on the broader issue of student unionization but around a voter list Harvard generated before the Nov. 2016 election. NLRB case law dictates employers must provide a complete and accurate list of eligible voters before a unionization election. 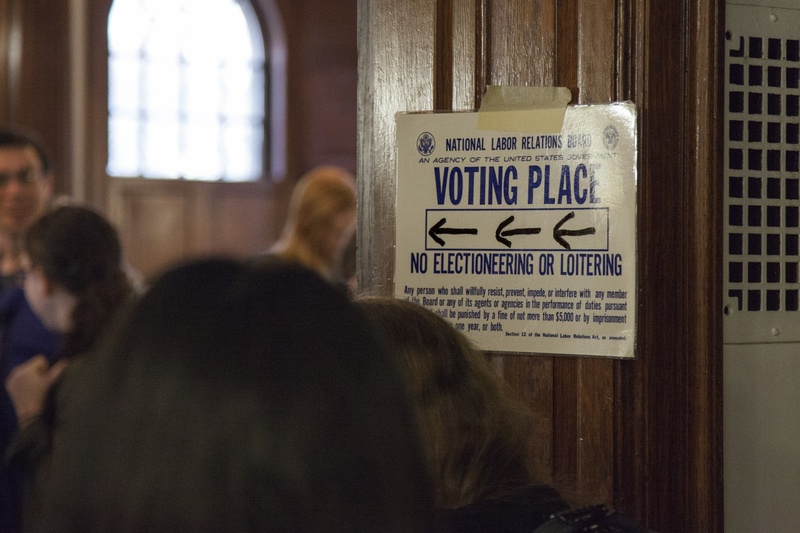 After voters went to the polls in November, HGSU-UAW filed an appeal with the NLRB, arguing Harvard’s list was inadequate in part because it excluded some eligible voters. For now, the Yale and Chicago challenges will likely not affect the timeline for Harvard’s unionization effort, Gould said. Only three of the five members of the NLRB chose to rule in Tuesday’s decision. Marvin E. Kaplan, a Trump appointee, and Philip A. Miscimarra, a Republican and the board’s chair, did not sign onto the ruling. Gould said it is normal for only three federal NLRB members to rule on any case. He said the entire board rules on “major policy cases,” but since Harvard’s appeal did not challenge the Columbia ruling, it did not qualify. In a press release, Julie Kushner, Region 9A Director of the United Automobile Workers, wrote that the NLRB’s ruling was an encouraging development. “This is another great victory for graduate workers in the UAW and a shot in the arm to this growing movement,” Kushner wrote.